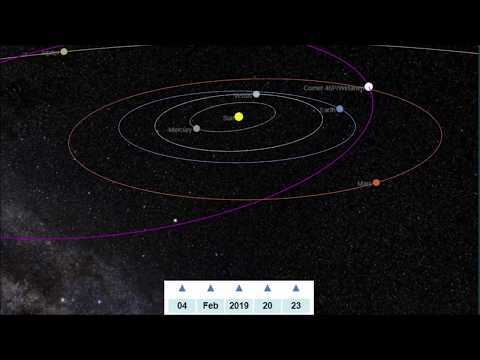 Comet Wirtanen is coming! The 1.2 kilometer object is earmarked to become the brightest comet of 2018. However, we hasten to add that this comet is unlikely to reach the status of a “Great Comet” such as Hale Bopp or Hyakutake. That being said, Wirtanen is predicted to reach an impressive brightness of visual magnitude +4 or maybe even +3. Therefore, this comet should become easily visible to the naked eye. 46P is a short period comet being no stranger to the inner solar system. The icy ball of rock was discovered by Carl A. Wirtanen in 1948 at the Lick Observatory, California via photographic plate. It was later realised that 46P has an orbital period of 5.4 years and is the source of a December meteor shower. 46P currently lies in the constellation of Taurus at a visual magnitude of +4 rising higher in altitude as each night passes. The object is already bright enough to observe in binoculars and possibly with the naked eye from a dark location. Those in the Southern hemisphere have enjoyed some decent observing conditions through the autumn. Now northern hemisphere observers get the chance to have some decent views being well placed for virtually all-night observation through December and January. Through December the comet’s apparent motion in the sky has increased as the object ‘catches up’ with Earth’s orbit. The icy rock then increased in brightness and conveniently headed rapidly higher up in to the sky through the constellations of Eridanus and Taurus. 46P then reached Perihelion on 12 December and closest approach to the Earth occurred just four days later on 16 December. At this point Wirtanen will pass 0.078 AU (7,220,000 miles) from the Earth. On the night of 16-17 December, the comet will lie almost directly between two famous clusters in Taurus namely the Pleiades and Hyades clusters making it an easy target to point out to intrigued family and friends. For many bright comets, their orbit usually takes them inside the Earth’s orbit, closer to the Sun (hence an increased brightness). However this means that during the days of a comet’s brightest magnitude, it is positioned near the Sun in the sky as viewed from the Earth (often drowned in twilight). However, Wirtanen’s orbit lies just outside the Earth’s orbit. This means at the point of Perihelion, the comet will be conveniently positioned opposite the Sun in the sky away from the glare of twilight and visible for much of the night. Why is 46P so bright this time around? Is there any danger to Earth? The answer to this one is easy. No, there is no threat posed to the Earth from Comet 46P. Granted this approach is close, in fact it’s the 10th closest approach of a comet since the 1950’s. However, Comet Wirtanen’s closest distance from the Earth of 7.2M miles is not close enough to have an influence on the planet. The comet’s orbit has been well known since discovery in 1948 and despite having an erratic orbit, there is no evidence of any likely future impact with the Earth. So we can simply enjoy the show especially considering there are not currently any comets predicted to reach this brightness anytime in the near future. Very disappointing to see, being just visible as a faint smudge in an unlit area of Lincolnshire, using 10×50 binoculars and averted vision at 03:00 UTC on 19th December. The Moon is now beginning to wash out the comet. It was brighter on the 12th, the last time we had clear skies here, and could be seen when viewed straight on, using the same binoculars. It’s definitely not been a naked eye comet during the past couple of weeks. the Moon isn’t washing out the comet so much now and even with it being full, finding the comet wasn’t too difficult. I did have to use averted vision then and I still need to now. However, before the Moon became full finding Comet Wirtanen was VERY easy with my 7X50 binoculars because it’s been so HUGE – truly as big as a full moon. Large and DIFFUSE, a lot like Comet Hyakutake in 1996 but with the light more spread out over a more gaseous head.